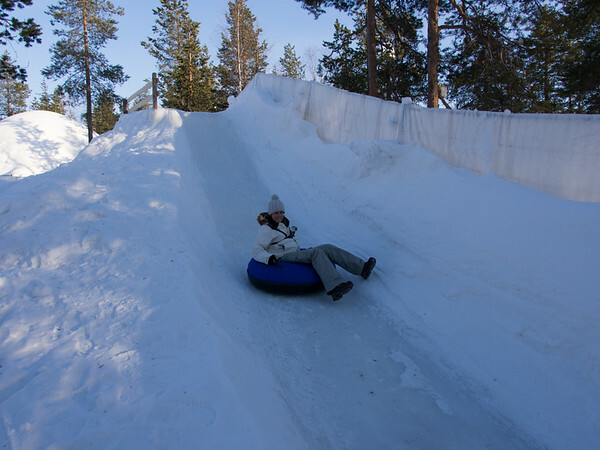 Sometimes I feel like my entire trip to Lapland was simply an excuse to indulge my inner child for a month. After all, I spent the entire time playing in heaping piles of snow, trying to make up for the fact that the first time I saw any snow stick to the ground was just before my 18th birthday. I felt like a kid on Christmas Day as I flew around a track made entirely out of ice in a go kart. What better way was there to top it all off than visiting Santa’s home itself? Thankfully, the commonly-held belief that Santa lives at the North Pole is wrong. His actual home in Finnish Lapland is much more accessible. And, as fun as I think living at the North Pole would be with the constant blizzard conditions and complete lack of inhabitable land — not to mention the fact that the auroral oval would wrap all around you with very little chance of you actually seeing it — I think Santa’s picked a much better place to live. 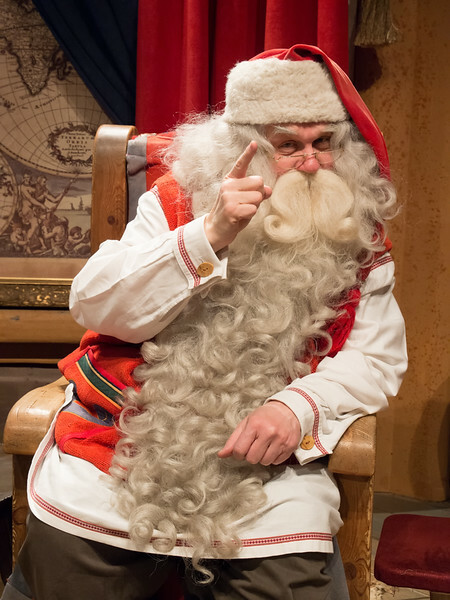 Santa actually has a home and an office (or really, two offices, if you consider the fact that you can now visit him at Santa’s Resort in Kakslauttanen as well). His true home is on the rolling Lappish fells of Korvatunturi, a name that translates to English as “ear fell.” Aside from the fact that it looks like an ear, it’s also said that living there lets Santa listen to the wishes of the children of the world so he can make them come true on Christmas Eve. 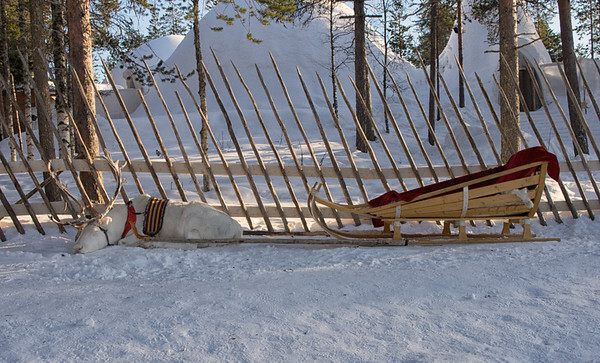 One of Santa’s reindeer taking a nap before he has to fly Santa back home again. Korvatunturi would have been a bit of a trek — one that’s made much easier by Santa’s reindeer, I’m sure — but his office was not. 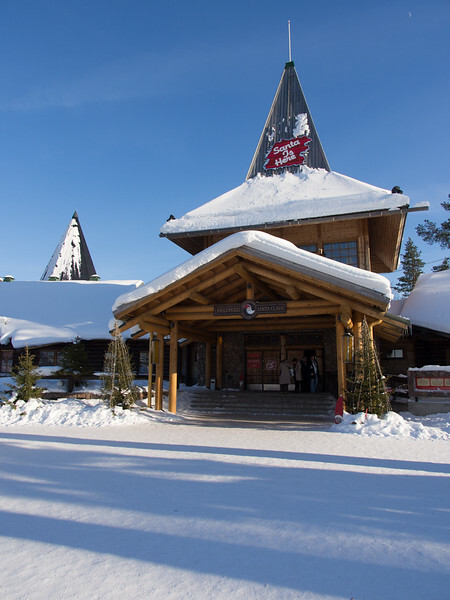 Conveniently located right on the Arctic Circle just outside the “Capital of Lapland,” Rovaniemi, Santa Claus Village very much resembles a Christmasy Disneyland. Yes, that means it is very commercial — full of both normal stores and those dedicated to Christmas — but I didn’t feel like it was as in-your-face as Disney is. It was very easy, at least for me, to move on straight to the main attractions. The first was Santa’s Post Office, which was full of all sorts of small delights. 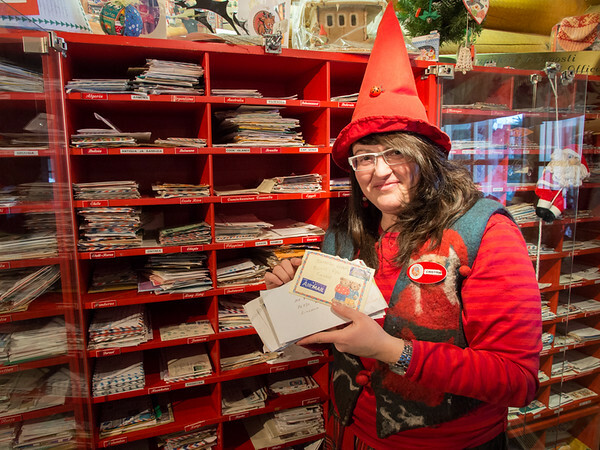 For one, you can buy cards there and put them in one of two post boxes — one labeled “for now” and one “for Christmas.” Not only can you get your Christmas cards out of the way, but they’ll come with a special Santa’s Post Office postmark. How good is that? The office was bustling, full of people filling out their Christmas lists to send to Santa. There were plenty of elves there too. The elf that I talked to, Cristina, told me about all the letters that are sorted there — and the numbers were mind-boggling. Every year, the post office receives hundreds of thousands of letters (550,000 last year) from all over the world. Anytime someone writes a letter addressed to Santa, North Pole (or anything similar), it gets redirected here. All of the letters are opened and read, and tens of thousands receive responses each year. They wish they could respond to more, but I was amazed that they can even get through that many! Cristina the elf with some of the many letters that Santa receives each year. On one of the walls there were rows and rows of post boxes, each labeled with a country and containing a selection of letters received from that country in the last year. Cristina showed me a few from Finland and some from Australia, all of which were adorably decorated in 5-year-old’s drawings. That alone would have been enough for me to leave with a smile on my face. We then took the long walk through Santa’s workshop, full of Christmas cheer for people to enjoy as they wait in line — a line that wasn’t all that long in March, but I’m sure is out the door in December. Having a great visit with Santa! Walking in to see Santa, I could almost envision myself being a kid going to sit on Santa’s lap at the mall. There were cameras and TVs on one side to capture the moment for excited parents to share, but I quickly forgot them after introducing myself to Santa. Rather than just having a quick visit where I told him what I wanted and left, we had an engrossing 15-minute conversation. He struck me as someone who is truly interested in the stories that everyone has to tell. By far the most grin-inducing moment was when Santa told me he’d read my blog and thought I was a very good photographer. Never did I think I would hear that from Santa! I left the room feeling that same giddy feeling I’d had so many times across Lapland. I could only imagine how truly excited the children that flock to Santa’s Village would be after having a similar conversation, knowing that Santa was a very nice fellow that truly cared about him (or her) no matter how many people were vying for his attention. As if that wasn’t enough happiness for one day, I topped off my visit by going to nearby Arctice, which was much more than an ice bar (which makes sense, since much of the village is geared towards children). In fact, the only things I paid attention to were outside — specifically, the ice slides. On the advice of the people working there, I skipped the small slide and went straight to the largest one. It was only once I’d dragged my tube up the small hill that I realised just how steep a drop the slide had, but I didn’t give myself time to think about it before pushing myself over the edge. Flying down the ice slide. Yes, I have crazy eyes. What a rush! I flew down the track, spinning in circles with absolutely no control at all. It was much faster than the summer tube track I’d ridden on in Lake Tekapo, NZ, the year before, and I spun around enough that my GoPro flew forward and spent most of my ride recording my leg. One ride wasn’t enough — once my head stopped spinning, I picked up the tube and went straight back to the top of the track for another go. 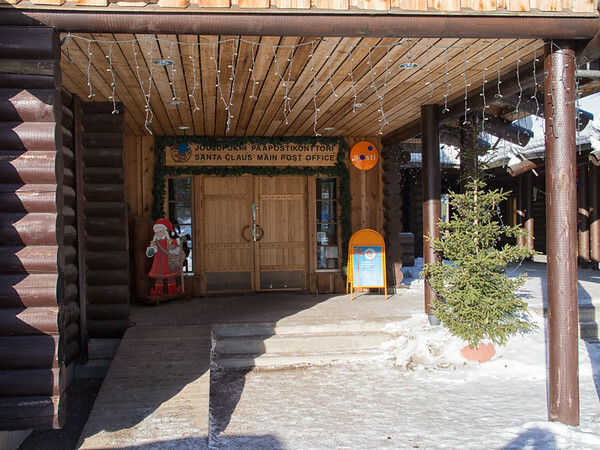 I left Santa Claus Village feeling like a very contented big kid. And really…that’s all I could have asked for. 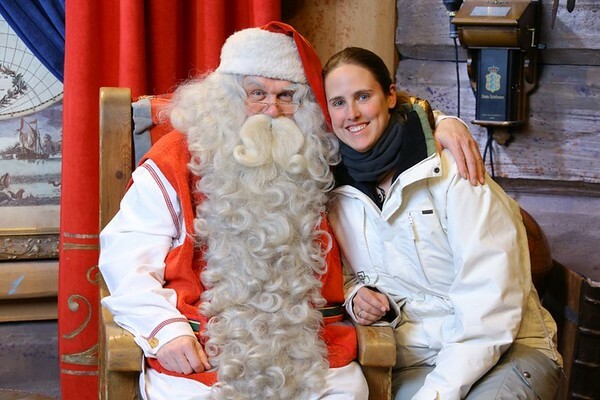 I visited Santa Claus Village as a guest of Visit Rovaniemi and Visit Finland. The village is located to the north of Rovaniemi on E75, right on the Arctic Circle (you can actually stand on the line and take photos, which I somehow forgot to do). It’s open year round but is much busier in the lead-up to Christmas! Visits to Santa and his post office are free. Entrance to Arctice costs €12.